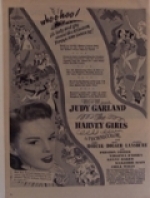 Actual ad from the movie staring Judy Garland, Ray Bolger, and Angela Lansbury. Ad size is 10 1/4" wide X 13 1/2" high, is original, complete and in great condition. Great for framing. Perfect for the Harvey Girl enthusiast.